Check out this week's Fresh Deals! We've got ORGANIC heirloom tomatoes going for just $2.99/lb! Get 4 ORGANIC mangoes for only $5! ORGANIC red seedless grapes are just $2.49/lb. ORGANIC green bell peppers are just $1.99/lb. And get ORGANIC yellow peaches, ONLY $2.99/lb! And grab some ORGANIC limes, just $1.29/lb! Drop by our Meat Dept. this week and SAVE $3/lb on Painted Hills Top Sirloin OR Coulotte steaks! Or SAVE $2/lb on boneless ribeyes! Feelin' fishy? SAVE $10/lb on FRESH, wild-caught halibut! We've also got ORGANIC chicken breast on sale, SAVE $2/lb! 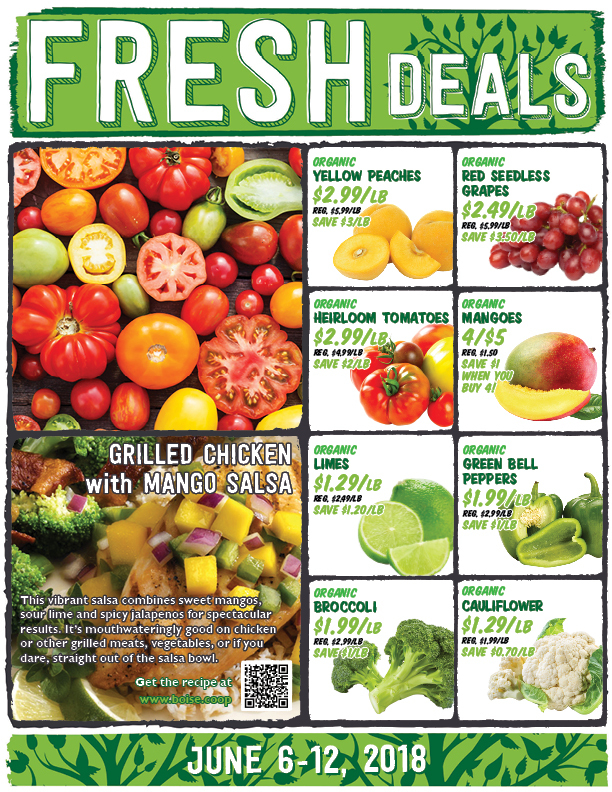 Need something to make with the chicken breast, limes, mangoes, and bell peppers on sale? Try out this awesome RECIPE. This week in our Deli, SAVE $2 on our HOUSEMADE 14" Take N' Bake cheese or pepperoni pizzas- and you can get them wheat free for just $1 more! We've got great deals on select Organic Valley cheeses, like sliced provolone, Swiss, or cheddar for only $4.39 (6-7 oz). Need to get back in the Bulk aisle? SAVE $3/lb on ORGANIC chili lime mango! Or SAVE $2 on BULK+ORGANIC peanut butter! Check Out the Fresh Deals!